ST. PETERSBURG, Fla.-- The Los Angeles Dodgers, New York Yankees and Tampa Bay Rays each had a pair of farmhands named the Topps Player of the Year in their respective leagues. Thirteen MLB farm systems are represented in the annual George M. Trautman Awards, presented in the 16 domestic Minor Leagues by the Topps Company of New York, in conjunction with Minor League Baseball. Great Lakes shortstop Dee Gordon hit .301 with a league-leading 12 triples and 73 stolen bases in winning Topps Player of the Year honors in the Midwest League. The other Dodgers Minor Leaguer to claim his circuit's award is outfielder Brian Cavazos-Galvez of the Ogden Raptors. Cavazos-Galvez tied for the Pioneer League lead with 18 homers and led the loop in hits (97); runs (59); extra base hits (50); and doubles (29). Scranton/Wilkes-Barre outfielder Shelley Duncan and Tampa catcher Austin Romine are the two Yankees farmhands selected. 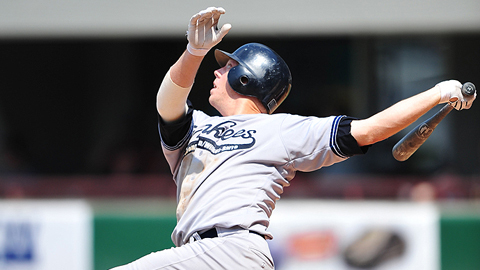 Duncan paced the International League in home runs (30); RBI (99); runs (85); and extra base hits (61). Romine finished in the top five in several Florida State League offensive categories, including doubles, RBI and extra base hits. The two Tampa Bay honorees are outfielder Desmond Jennings and right-handed pitcher Alexander Colome. Jennings was among the Southern League leaders in average, stolen bases, triples, on-base percentage and slugging percentage, despite playing only 100 games for the Montgomery Biscuits before being promoted to Triple-A. Colome was overpowering in the New York-Penn League, as he led the circuit with 94 strikeouts and held opponents to a league-best .174 average against him. His 1.66 ERA was second best in the NY-Penn. Topps salutes the top performances throughout Minor League Baseball, including monthly awards and All-Star teams in each classification.